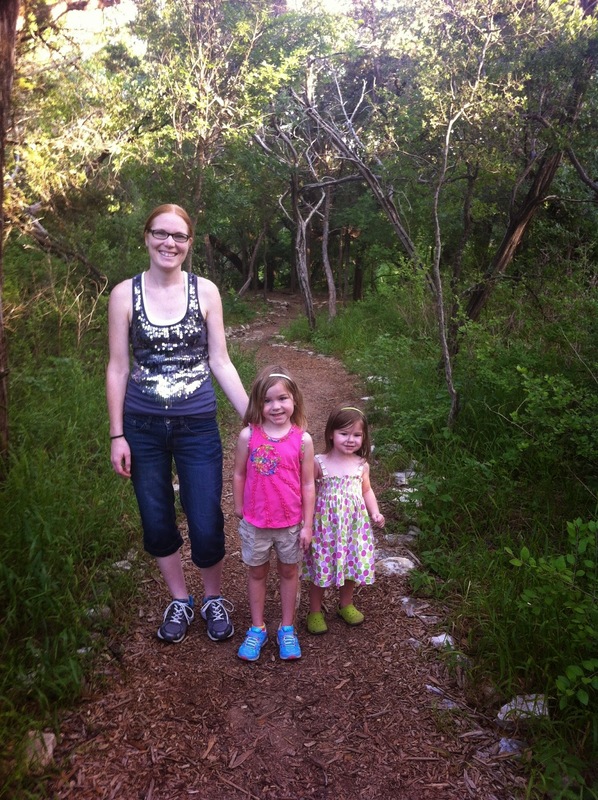 So we were actually heading to Austin to meet up with my sister-in-law and her new husband at Mount Bonnell, but our family wasn't as close as we were so we had some time to kill. 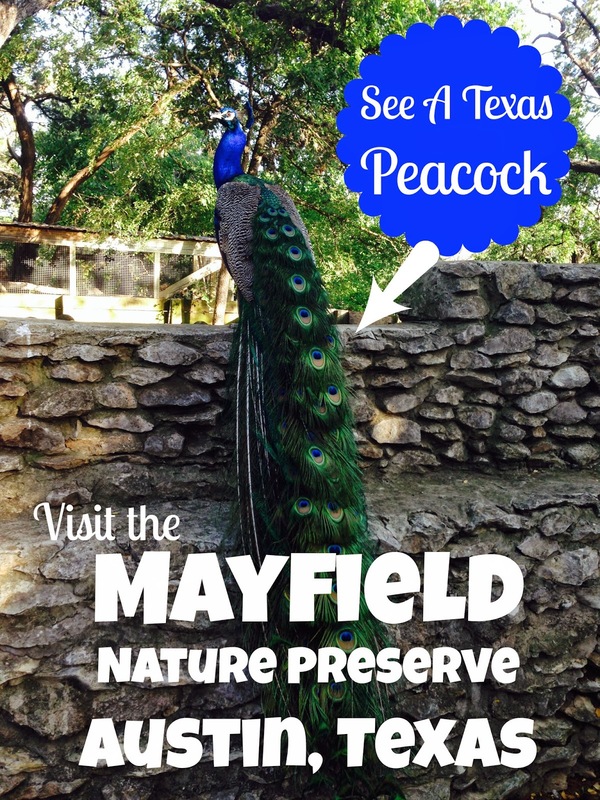 We saw a sign for Mayfield Nature Preserve right down the street. We thought we'd check it out. What?! 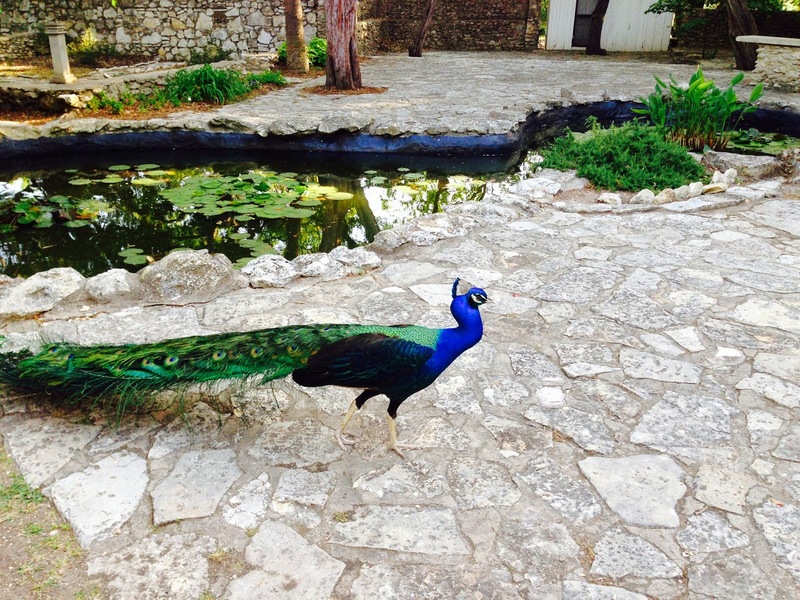 Is that a peacock running around? Wait?! Is that a group of peacocks? Where am I? This can't be Austin, Texas, but yes it actually is! This place is so cute and quaint. We didn't have a whole lot of time to explore but what we did find out is that Mayfield Park includes a historic cottage that operates as an event center, so you can rent the cottage out for private events or weddings. 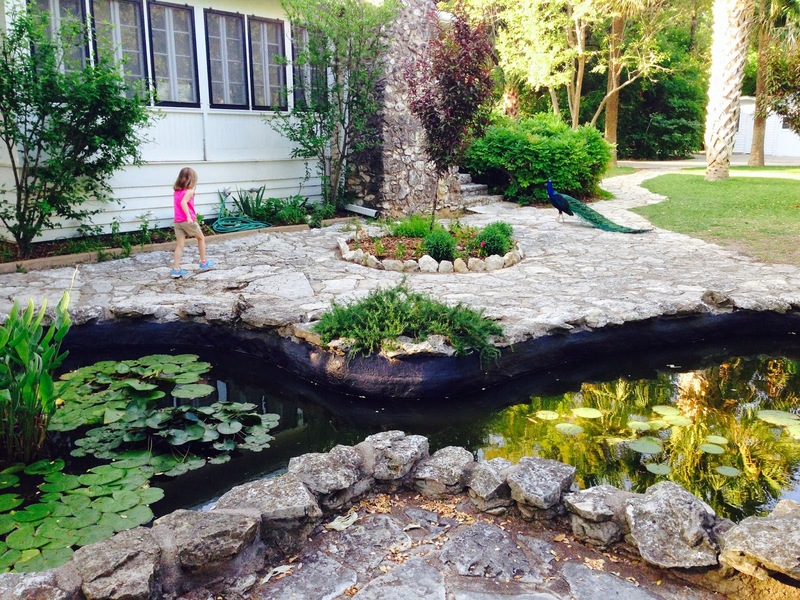 There is also a 2 acre sized garden that has ponds, water lilies, beautiful flowers and the peacocks that just roam around the area. There is also the 21 acres which makes up the rest of the preserve and it surrounds the park and contains walking trails and wildlife habitat. We only went on the short loop trail because of time but it was very easy walking for my girls, although there are some steps along the way, so not completely flat and there were some rocks and roots that they had to maneuver over but overall a pretty easy walk. We could have used our off road stroller with no problem if we wanted too. But the walk was so short anyways that we didn't really even need it. 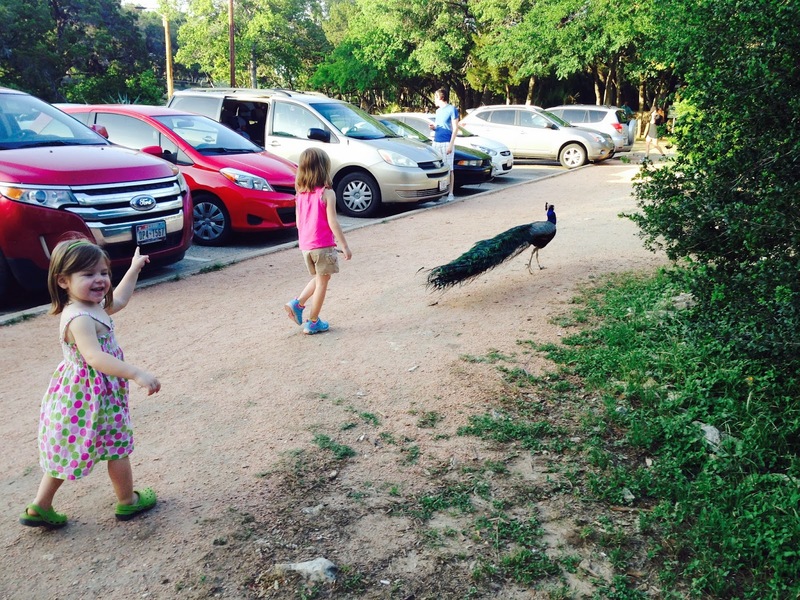 We have plans to go back when some of my family comes out to explore more of the trails and let my children try to catch the peacocks again, lol. Okay, not really, but if you move really slow and you're in the right place you can catch a brush of the male peacocks tail like I did. 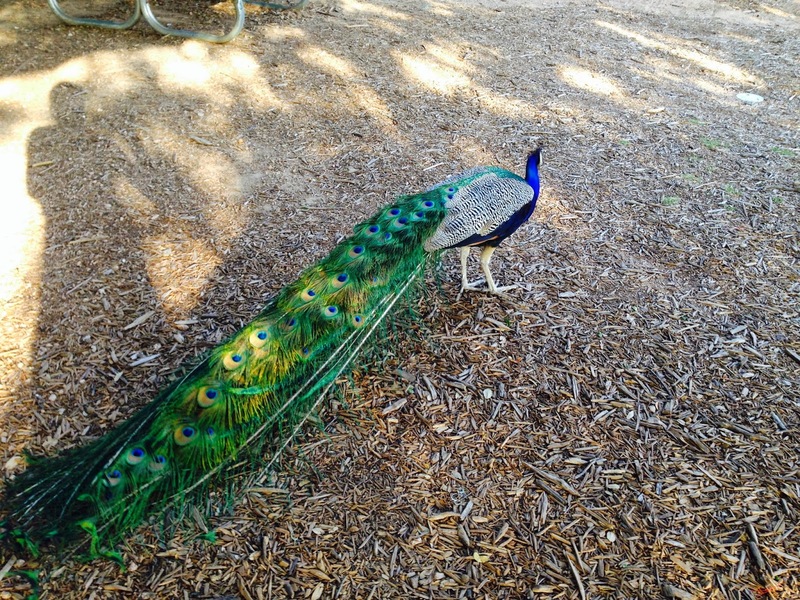 We also go to see one of the males put up his tail feathers. I've never seen the backside. It was really cool. We saw how the larger feathers in back are what push up the decorative feathers on top. 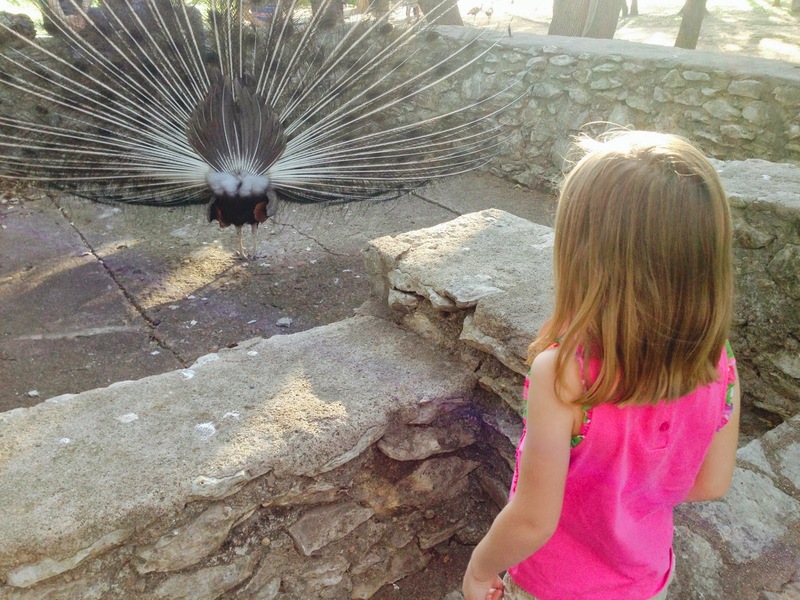 A great homeschool lesson to add to our adventures. One family matter note: there is only a porta potty for restrooms. And it wasn't very clean and no soap sanitizer when we used it, so make sure you get your little ones to go ahead of time. But at least there is an option. 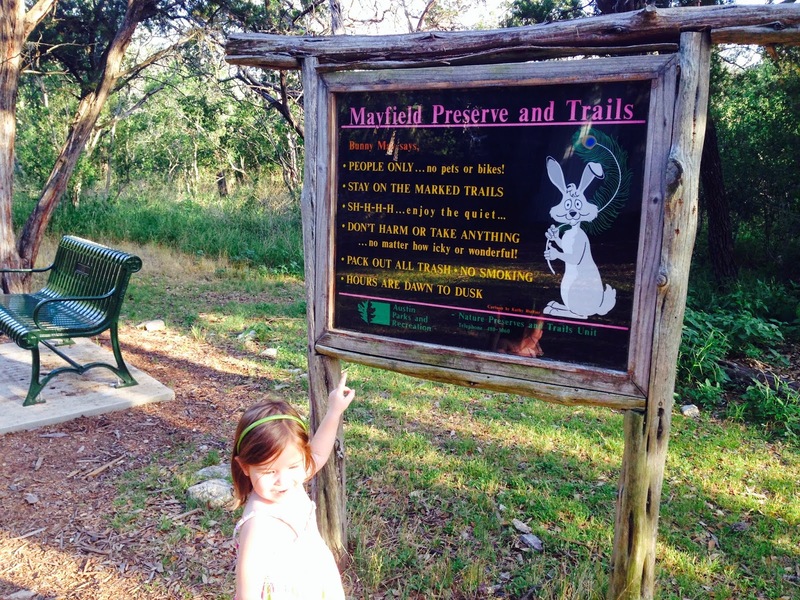 So, when you have some time to go to Austin, Texas be sure to make a quick stop at the Mayfield Nature Preserve and Mount Bonnell which are just down the street from each other. 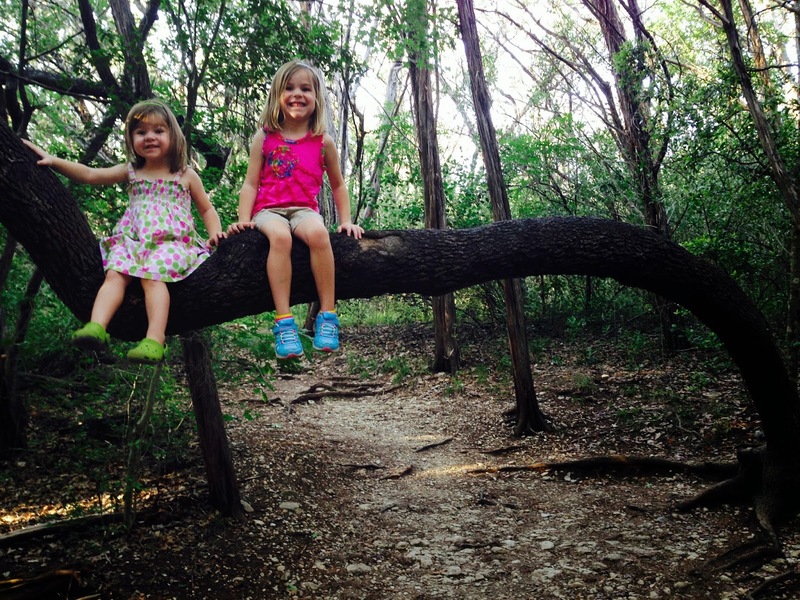 I'll be posting about Mount Bonnell next. Be sure to check it out. 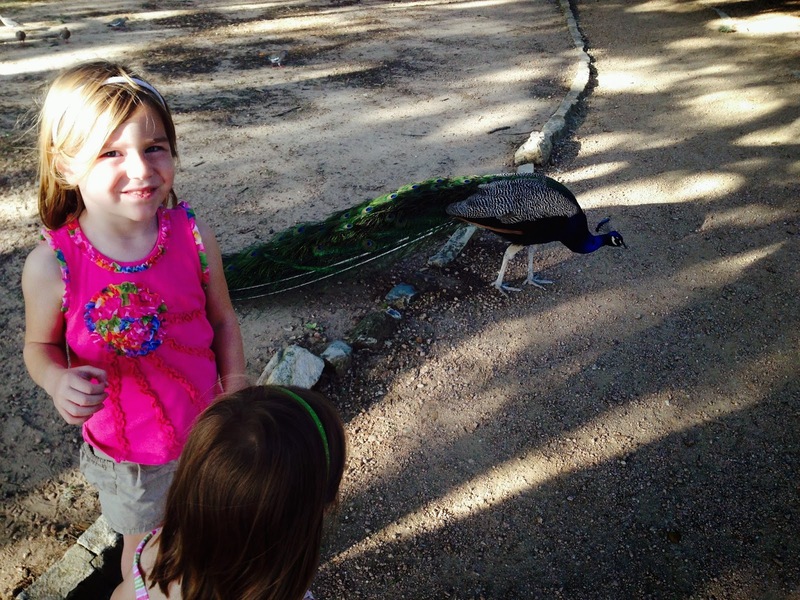 My girls loved to chase around the peacocks (at a slow pace of course). Does anyone else have a crappy backyard layout? I'm just being real and calling it for what it is! I can hear at least a couple people shouting, "amen!" A few years back now, we had our house build in Texas while we were still living in Arizona. I still know that it was God's plan and it's so cool to see his handiwork in getting us to Texas but....let's just say we learned a few things along the way. We had never had a house built. We learned that we will probably never want to do it again to be honest. However, one of our complaints was that we saw a printed layout of our house before we moved out but I don't believe they ever even showed us how our house would be situated on that lot. (I know! We should have asked. But lesson learned!) We were getting what we thought was a huge lot. We were in a cul de sac lot and were paying extra because of it so we weren't really worried about the size of our yard. We walked on the lot before we signed the papers and it looked huge!! But, needless to say, we have a stupidly shaped yard. They placed our house so far back on our lot that we have a LONG driveway and long front side yards and well....a stupidly shaped backyard. We walk right outside our back door and we have our neighbors fence smack in our face. Okay, well maybe it's like 9 feet away...but it's really close people!! With it being SO close most of our concern and problem is with toys and balls being thrown into other people's yard and when your neighbors aren't very friendly and their dogs are mean you don't really get anything back. *Sigh. We also only have a stub of a patio which is like 2 feet by 3 feet wide. We've wanted to add a large concrete patio slab but after counting the cost we ended up building the shades first and making it have the 'feel' of a patio without the huge expense of a patio. Plus, we've had these shades in our closet for the last 6 years!! I kid you not! My In-laws were shopping at Costco one time and knew we were searching for a good deal and it was the end of Summer in Phoenix and they got 3 on mark down for us. It was a great deal. Surely we'd use them, right? Well, we finally have these 6 years later and I want to show you how we did it. My husband went to a local lumber yard and bought some 12 foot cedar posts. He paid a pretty penny and you should too because they are going to take a beating with the winds and the last thing you want is a shade breaking off and flapping dangerously around in a fierce storm. 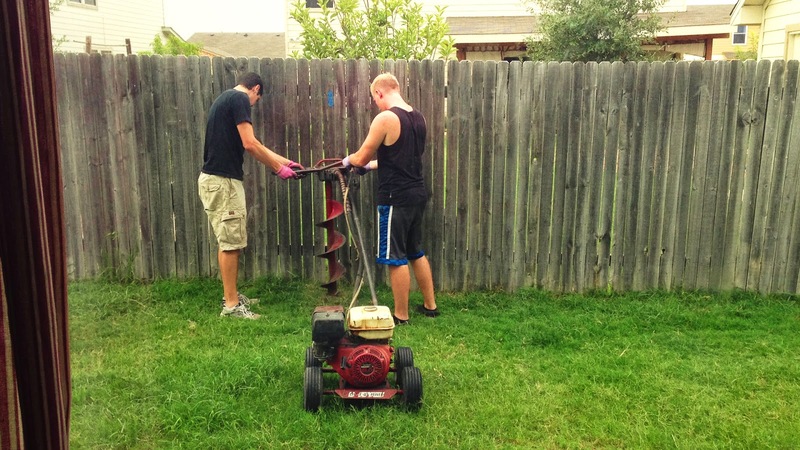 He also rented a one man auger machine, which in reality takes two people really but that's what it's called. Along with that he got some Quikcrete bags to solidify the posts into. With everything at hand we looked at the size of the shades and we wanted it to float evenly in the middle between the house and fence. It's been awhile since we put these in but I believe it ended up being about 3 fee we added on each corner. We put it at an angle, so it was slightly higher up on the house. We had a hard time figuring out how far apart to put the beams. 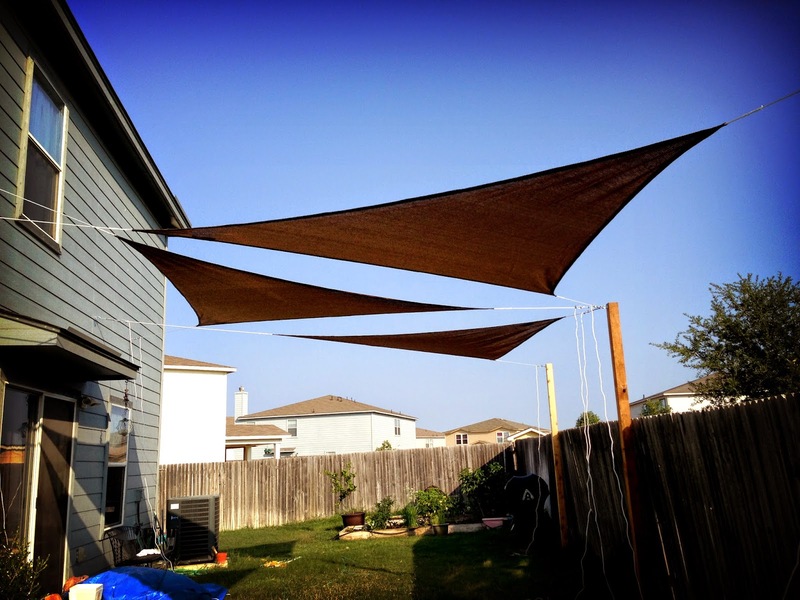 We wanted to make sure we put enough room to be able to have length to tighten as the shade got pulled loose from wind and such but we also didn't want it to be too far apart and not have the shades provide adequate coverage. We didn't want three triangle spots of shade but rather as close to a unified shade as possible. We ended up setting the poles roughly 21 feet apart. As you'll see in the pictures it was enough to keep them from overlapping but we might have been able to get them a foot or two closer. But we're happy with how they turned out. We used painter's tape on the fence to mark where to dig. Ryan and my brother set off to work digging the first hole. One thing to note here: make sure you know what your rented equipment can do, otherwise you might end up in a big mess. Enter mess....Ryan and Darren dug down the drill end really quickly into the ground. Now if the auger you rented had a reverse switch that wouldn't be a big deal but...ours didn't. 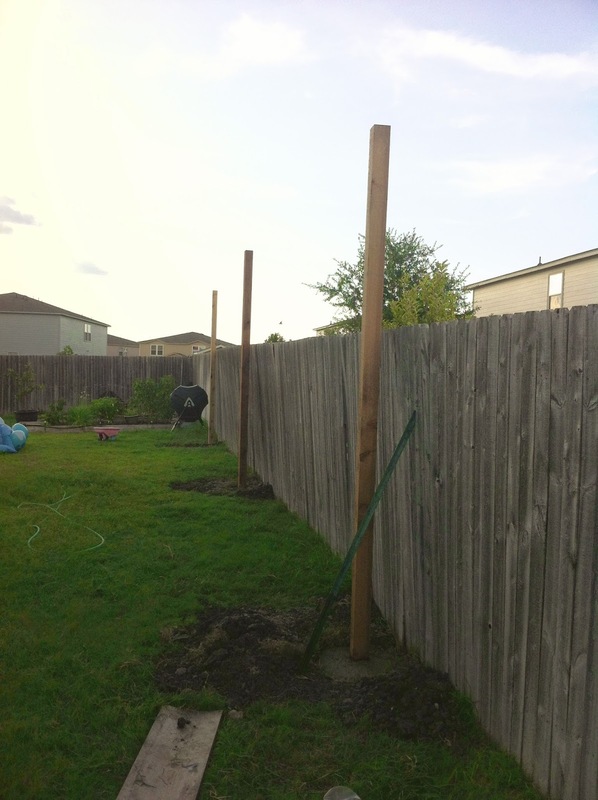 The guys didn't realize that because of our hard clay based ground (which will be great for holding these poles up, but not great for working with it) they dug down so fast they didn't even give it a chance to pull up any dirt. They pretty much just drilled it into clay and there it was stuck...for the next 3 hours it took all of us to dig it out of the ground. So if you look really closely you'll see the the base of the the farthest post has a very wide concrete bottom. So after learning from their lesson, they jammed out the last two poled in less than 30 minutes. They dug down about 30 inches my husband said, which is as far as this auger let them go pretty much. We probably would have gone down more if possible but with our hard ground it will (and has) held up fine. Instead of going so fast with the auger they put it in slowly and let the drill slowly pull out the clay as it went down. They had to pull it back up every so often because it wants to go down much faster than it should. So they drilled a little. Stopped. Pulled it back up, just to clean out the drill and then they put it back in to go down a little farther. Now that you we had our holes they mixed the concrete bags with the water. While I held the post in the right spot using a level, Ryan was able to fill in all around the pole. It was such a deep hole we really didn't even have to prop up the poles from leaning. We kept checking them periodically but they never even tilted, which was awesome! After your posts are set then you need to add the hardware to the top of the posts. My husband just went to the store and got what he needed. He got a cable tensioner with a hook and some eyes that he was able to mount on the posts. He also got a few wire cable clamps (one for each corner of the shade) I included some pictures so you can see the hardware and how he mounted them on. Make sure to leave some slack on the rope and just use those small little nuts to tighten up and hold the extra rope. You need enough to hang on and pull so you can tighten the shade later. You can slowly clip off the excess if needed though, just don't cut too short!! Once you have the hardware on your post then attach your shades onto the top of the beams. At this point it's kind of a grab the ladder and hold up where the shade would go on the house and mark where it will look the best. We started with the middle shade because that gave us our control. We wanted the other shades to fit as closely to the middle one as possible. The shades are angled slightly, so the mounts are raised a little bit higher on the house versus the posts. It makes it have a more open feel than if they were just flat. After the middle one was set we started with one side shade at a time and pulled the rope to the best spot so there was as little gap as possible between the shades but we also didn't want them to rub. You can see in this photo the final placement of where the ropes were attached to the house. After everything was adjusted and tightened we snapped a couple more photos. 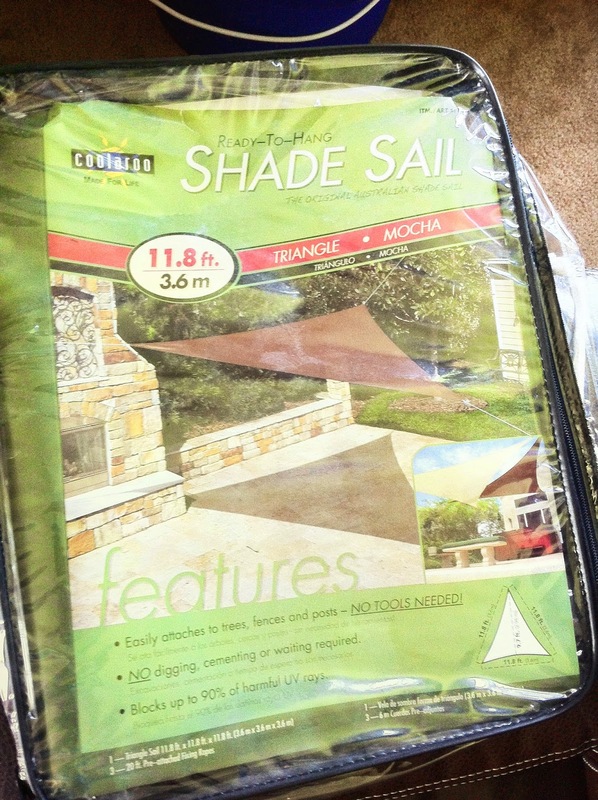 Please note that you need to plan to tighten your shade after a couple days of good wind. 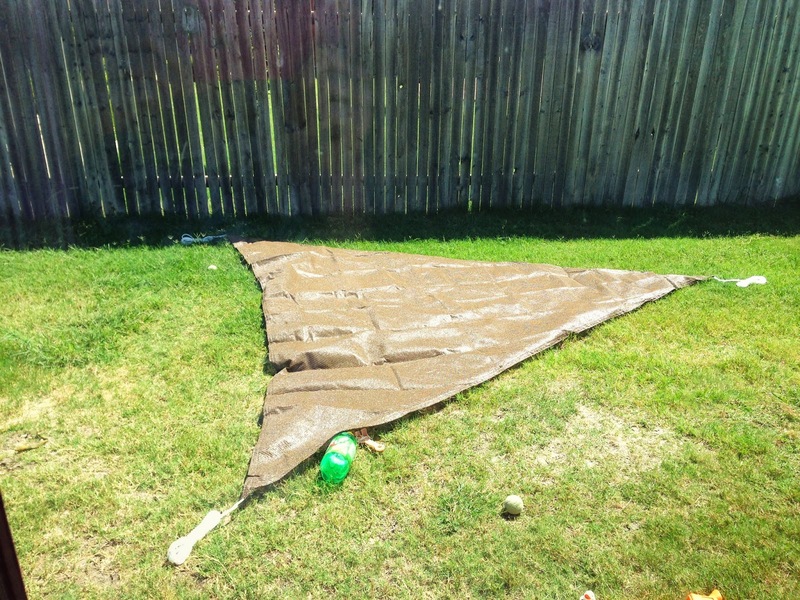 The shade will loosen a lot after it finally gets pulled tight by the wind. My husband has gotten in a good habit of after a really bad storm he will tighten them back up again or he just plans to do it during the Summer. 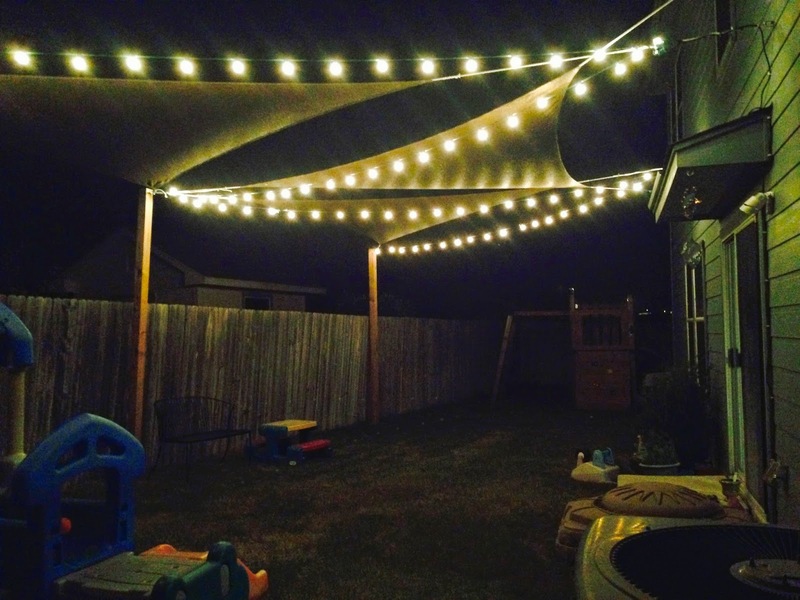 We also added some strings of outdoor lights onto the shades. 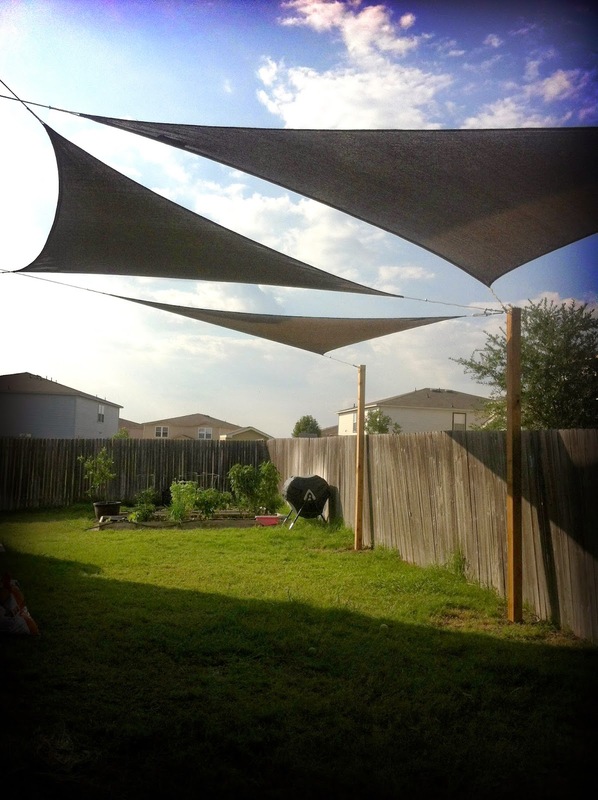 We just strung them up around the shade hardware and ziptied them onto where they wouldn't slip. We used 3 strands and had a bunch extra so we took off the extra bulbs and stapled it to the back of the last post. So you can't see it from the front at all. Here are some more pictures to enjoy! 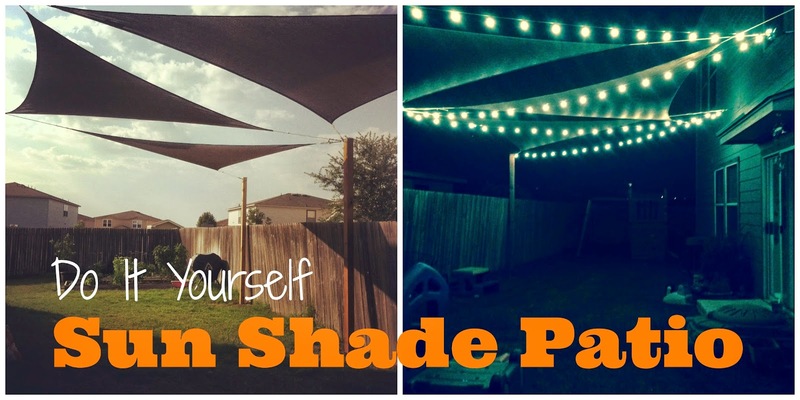 Well, I hope this has spurred you on to build your own sun shades. 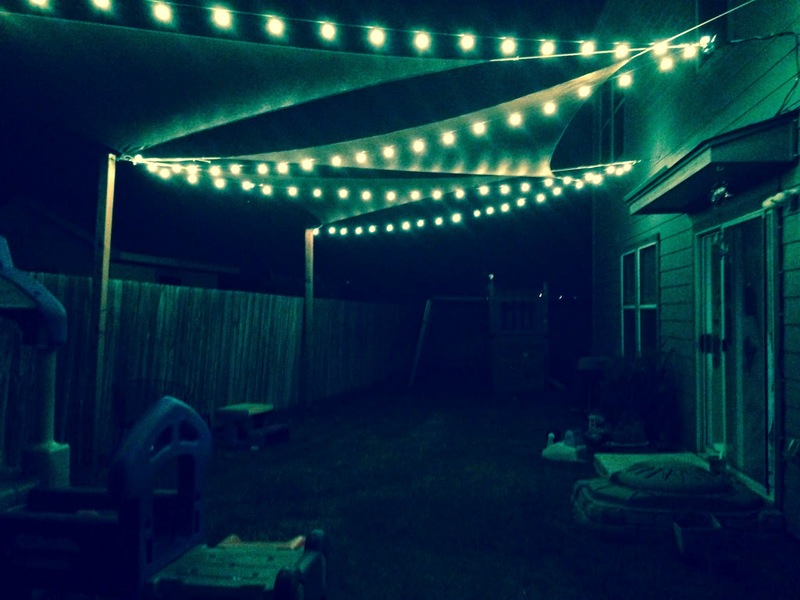 We enjoy the fact that it adds a patio feel without having to pay for the whole concrete slab. We recently bought a picnic table and put it underneath and enjoy our lunch outdoors sometimes now. Well, since I've been showing you a bit of our homeschool routine I thought I might as well show you the gem of the crop. 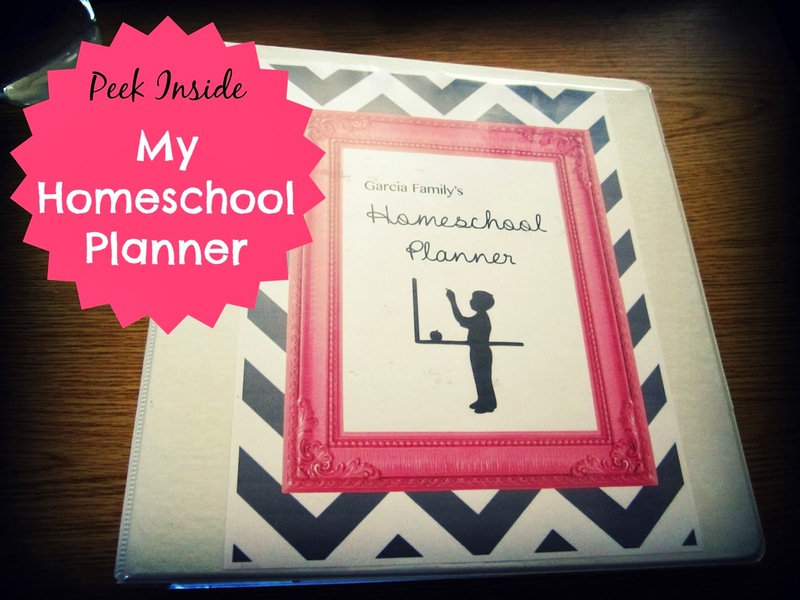 I'm going to take you through my entire homeschool planner. 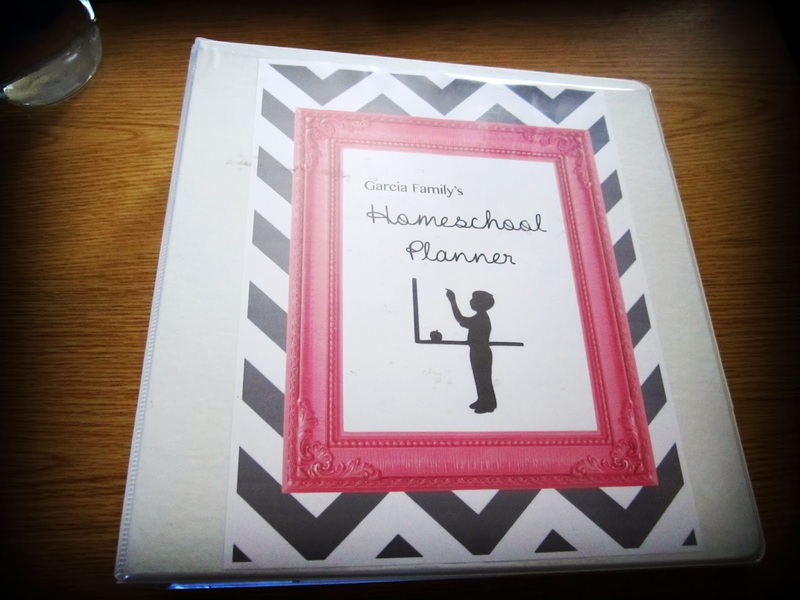 I've had a couple different lesson plans within my notebook that I've used and since homeschooling needs are ever changing I want to make sure to show you both versions. I hope you will find them beneficial to you. 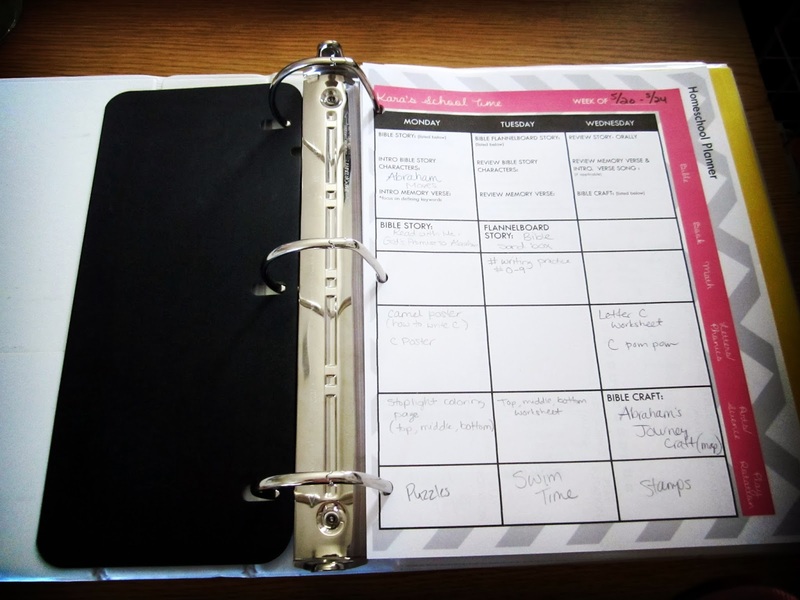 I'll go through the notebook with my original planner and then at the bottom I will show you a new revised planner I just created to help me get even more organized with things. Well, to start things off I created this cover. I just found a free frame, background and silhouette online and put them together to make my cover. I used this same theme to organize all of my binders and drawers etc. They all have the gray chevron with the happy pink frame that just makes me smile. This is the first version of my planner. This is what I access the most so that's why it's on top. I created this last year and it worked very well for me at the time. It gets broken down into each day (Thursday-Friday is on the back side) with the subjects listed at the side. I also included in type some of the things that were more consistent with our curriculum, so I didn't have to write it in all the time. 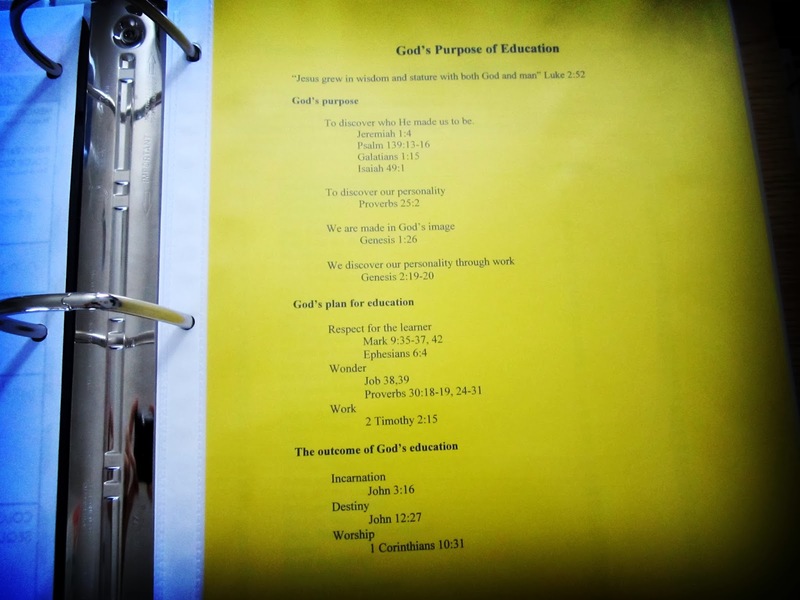 After my planner I have my God's Purpose Of Education Handout that I received at one of my teacher training way back when I was a kindergarten assistant teacher at a Christian school out in Arizona for over 8 years. We got lots of resources and training in my years there and this handout was found one day in my pile of things I saved. I'm keep it in here as Biblical reminders of why education is important and helps me remember the ultimate goal: raising up a generation of good character, who's heart is towards God and His ways. After that I have a couple table of contents or chapter guides for some of the curriculum I've chosen to use. This helps me at a glance to check what's up and coming. Sometimes I'll mark down the month or week we did something, so I know where we stand on everything. 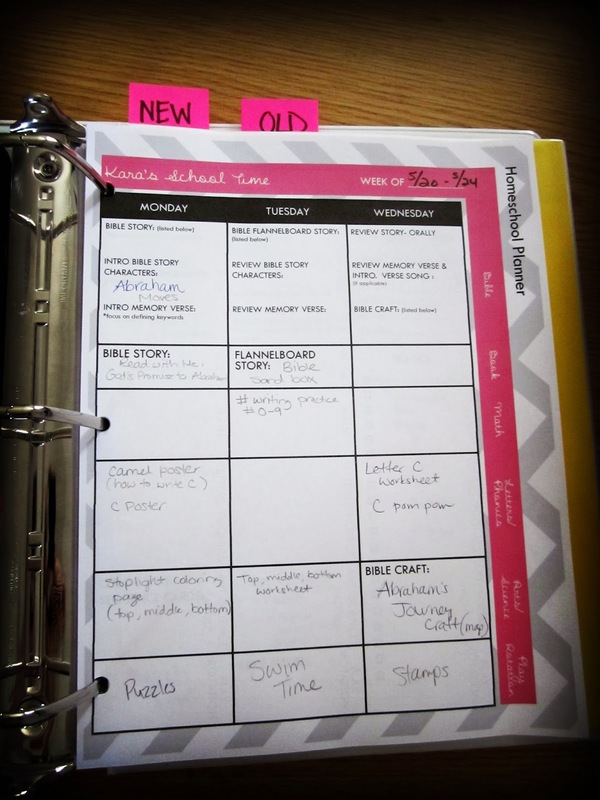 This has really helped me in saving time when it comes to planning next week. 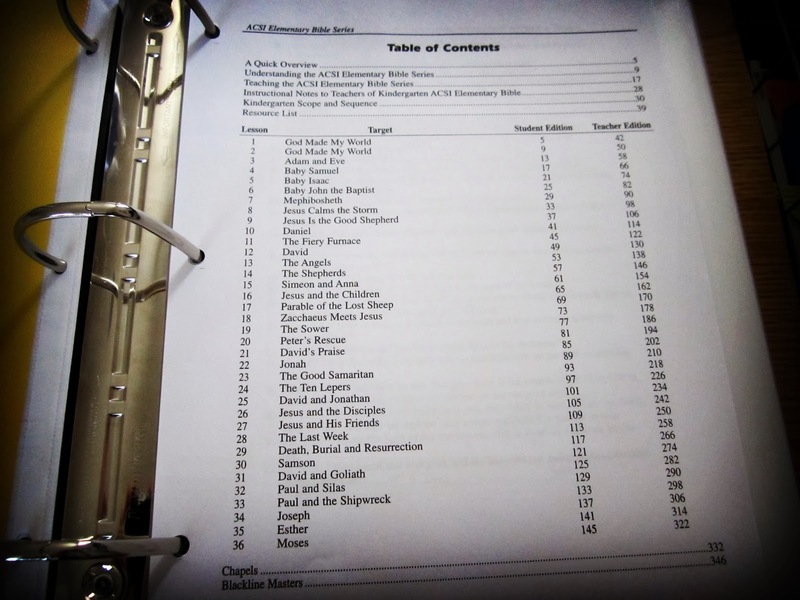 I can quickly pull from these Table of Contents of my main books: math, writing, Bible, etc. and have a better jumping off point. 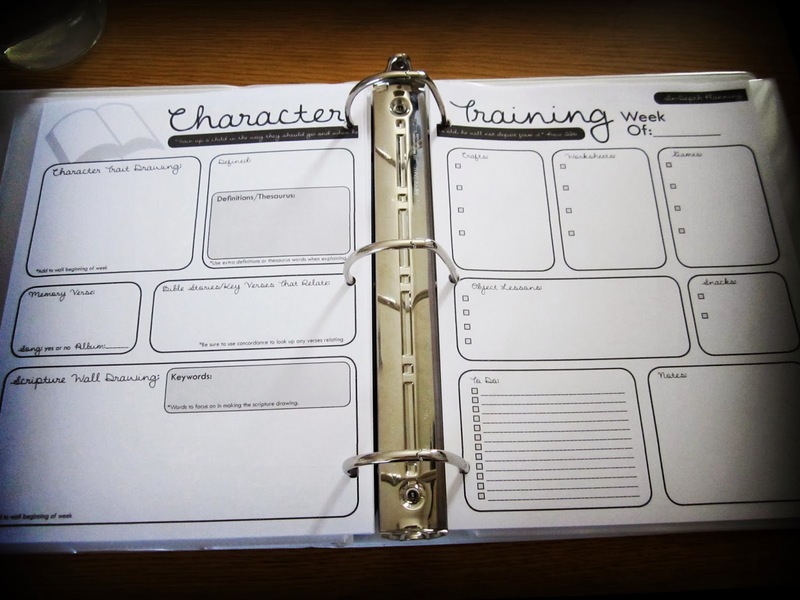 Next up is my Character Training Lesson Plan. I created this in the future hopes of starting to do a character focus for each week or month and work it into our plans. We haven't used it yet because my girls are still so little and we're just focusing on key traits like being 'nice' to our sister. Ha! But I thought I would just give you a peek at what I've prepared for the future too. It's important to have a vision. "Without vision the people perish" says the Bible. Lastly, to organize my old lesson plans I put two small sticky note tabs in the back of my binder. I place the 'old' lesson plans back there as well as keep on hand all my 'new' unused lesson plans for upcoming weeks. Makes it easy for me to look back to see what we focused on. I hope you've enjoyed peeking through my planner. 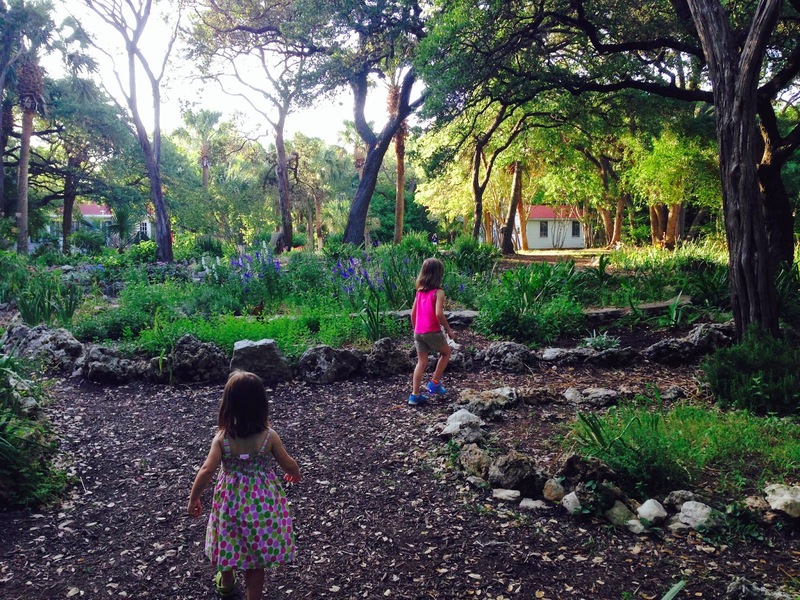 I'm still on this journey of learning to organize my homeschooling life with my girls. I can only share what works for us...and I'm sure I will find better ways along the way. 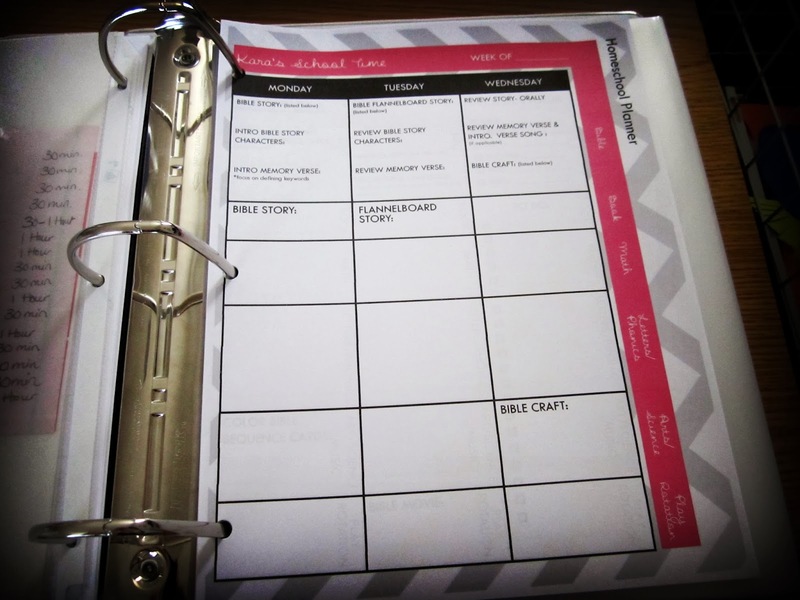 But I hope this inspires you to organize your planner.